3. Always slant test tubes away from yourself and others when heating them, adding substances to them, or rinsing them. 4. If instructed to smell a substance in a container, hold the container a short distance away and fan vapors towards your nose. 5. Do NOT substitute other chemicals/substances for those in the materials list unless instructed to do so by your teacher. 6. Do NOT take any materials or chemicals outside of the laboratory. 7. Stay out of storage areas unless instructed to be there and supervised by your teacher. 1. Turn off all burners, water, and gas, and disconnect all electrical devices. 2. Clean all pieces of equipment and return all materials to their proper places. 3. 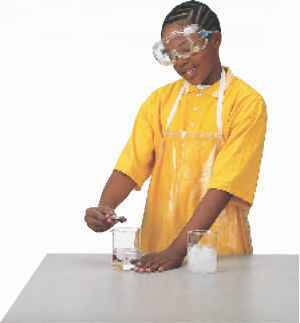 Dispose of chemicals and other materials as directed by your teacher. Place broken glass and solid substances in the proper containers. Never discard materials in the sink. 4. Clean your work area. 5. Wash your hands with soap and water thoroughly BEFORE removing your goggles. 1. Report any fire, electrical shock, glassware breakage, spill, or injury, no matter how small, to your teacher immediately. Follow his or her instructions. 2. If your clothing should catch fire, STOP, DROP, and ROLL. If possible, smother it with the fire blanket or get under a safety shower. NEVER RUN. 3. If a fire should occur, turn off all gas and leave the room according to established procedures. 4. In most instances, your teacher will clean up spills. Do NOT attempt to clean up spills unless you are given permission and instructions to do so. 5. If chemicals come into contact with your eyes or skin, notify your teacher immediately. Use the eyewash or flush your skin or eyes with large quantities of water. 6. The fire extinguisher and first-aid kit should only be used by your teacher unless it is an extreme emergency and you have been given permission. 7. If someone is injured or becomes ill, only a professional medical provider or someone certified in first aid should perform first-aid procedures.